Ever since I upgraded to latest Ubuntu 12.04 LTS, this issue has been bugging me a lot. Every now and then, a notification pops up saying "Ubuntu 12.04 has experienced and internal error" or "System Program Problem Detected" without actually causing any real troubles. I believe this has everything to do with Apport, a software error/crash reporting tool for Ubuntu (which is supposed to be in disabled state for stable releases). How to Disable 'System Program Problem Detected' Errors in Ubuntu 12.04 LTS? It used to happen very rarely when I first installed Ubuntu 12.04 LTS. But after several upgrades and new software installations, these errors have become more common place and sometimes annoying even. Disabling Apport permanently helped me solve this issue. This should work for you as well. Follow the steps. I prefer doing this in command line using VIM text editor. But for the sake of simplicity here, I will use GUI and gedit text editor. Hit Alt+F2 and type the following(screenshot above). Press ENTER afterwards. Save and exit. Do a system reboot. Everything should work fine from now on. 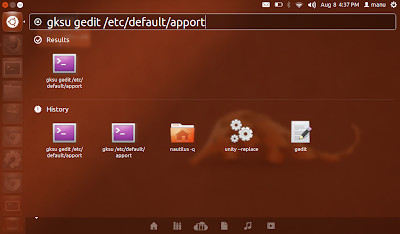 Thanks to Apport Ubuntu Wiki for the info. There, it is categorically stated that, "Apport is not enabled by default in stable releases, even if it is installed". I have no idea why it was enabled in two of my Ubuntu installations. Anyway, the issue is solved now. Thanks for reading.